Fratelli’s is relocating a few miles down Main Street with a Grayson address, but still, inside Snellville city limits with the same delicious Italian food people from far and wide have come to love. 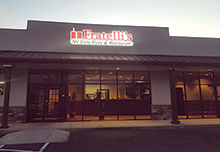 Fratelli’s new location as of April 17 is, 1711 Athens Highway, Grayson, GA 30017 and offers the same taste but in a “fancier, but simple” location, say, Doris Zaino. Zaino and her business partner, Danny Gomez, are the proud owners of Fratelli’s Pizza. BLAIRSVILLE -- United Community Banks, Inc. announced today that, after almost35 years of service, its Chief Executive Officer, Jimmy Tallent, will retire from his current position effective June 30, 2018. Lawrenceville – Businesses interested in having Gwinnett County Government as a customer are encouraged to attend the 12th Annual Supplier Symposium hosted by the Gwinnett County Purchasing Division on Thursday, April 26 from 8:30 a.m. to 11:30 a.m. at the Gwinnett Justice and Administration Center. The event is free. Lawrenceville –The Gwinnett County Board of Assessors mailed approximately 280,000 annual Notices of Assessment to residential and commercial property owners today. Buford — In celebration of Gwinnett County’s bicentennial, the Gwinnett Environmental and Heritage Center and the Georgia Nature Photographers Association (GNPA) are hosting an amateur photography competition and exhibit spotlighting local nature scenes with historical significance. Lawrenceville – Gwinnett citizens who want to serve the community and be engaged in the electoral process are encouraged to attend Gwinnett County’s poll official hiring events on April 10 in Duluth and April 12 in Buford.